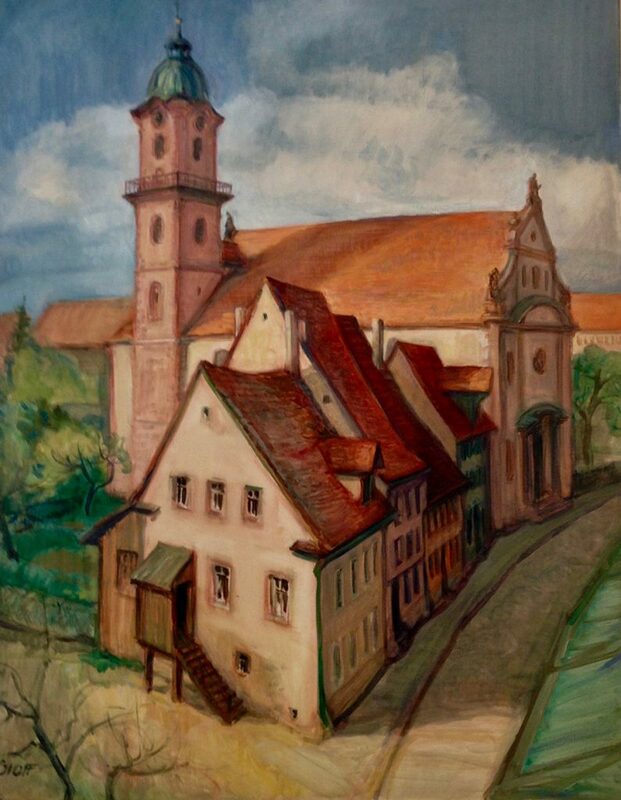 Painting of the home of Leo Schoenstein, first Schoenstein organbuilder near the Benedictine Church (Archdiocese of Freiburg). Villingen, an historic and charming walled city near Baden-Baden in Germany’s beautiful Black Forest, was the home of the original Schoenstein firm where Felix F. Schoenstein learned the trade from his family before emigrating to America to establish Schoenstein & Co.. Ed Schoenstein, grandson of Felix, and his wife Patricia visited Villingen to meet family members and search city records for official information on the family and the firm. Mr. & Mrs. Schoenstein arranged the donation of a portrait of Karl Schoenstein, Felix’s brother, to the Franciskaner Museum. They also visited the Villingen city archives to see an official document dated 1557 with the seal of Johannes Schoenstein, first documented member of the family.